- Six soother relaxation recorded sound:Choose from White Noise, Thunder, Ocean, Rain, Summer Night and Brook. sounds are engineered to mimic the natural environment to provide the most relaxing experience possible. - Bluetooth function: Connect your phone ,ipod or MP3 with Bluetooth and you don't need to plug in a AUX cable . 3 ,Press the remote control or host to replace the Previous or Next music. 4, Press the "Audio Switch" on the remote to replace from built in six music to bluetooth mode. 5, How to listen to music without turn on the light on : When the light is on , press the " Light Pattern" on the remote or the switch button on the base to the eighth mode , then turn off the red laser aurora by press " Aurora off " , then you can listen to the built in six music or your phone's songs. MARVELOUS AURORA NIGHT LIGHTS - Mixed color show (red,green,yellow,blue) create a romantic and peaceful relaxing environment. Enable you and your family to enjoy a comfortable night; help babies and adults fall asleep peacefully. With the cover on, it can be used as a small nightlight, helpful to people who are afraid of dark. 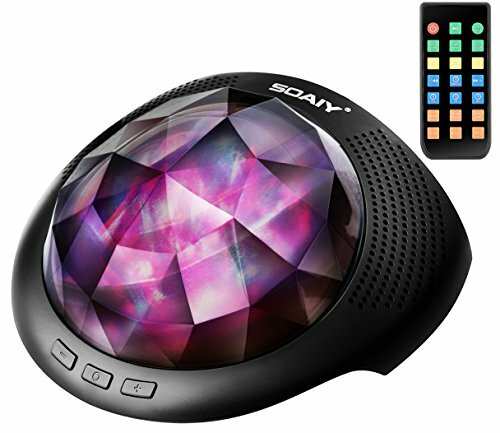 SOUND MACHINE WITH BLIETOOTH and BUILT-IN NATURE SOUNDS - Six built-in nature sounds: white noise, ocean wave, summer night, thunder, brook, and rain. Can be used as a Bluetooth speaker to listen to lullabies or relaxing music on your own cellphone, Ipod or tablet through Bluetooth pairing. A REMOTE CONTROL MAKE THINGS MORE CONVENIENT - You can use the remote to turn on/off the machine, make it rotate or not, adjust the brightness and volume levels, switch the nature sounds, shift the light & sound modes, and set timer. Easy to operate for both kids and adults. TIMER and BRIGHTNESS ADJUSTABLE - 4 timer options (1/2/4 hours and timer off ) to meet your demand. And also 3 brightness levels (30%, 60% and 100%) available to choose from. GREAT for TRAVEL - The device is of portable size, and can be charged through a power bank. You can take it anywhere for traveling or camping. Note: Laser projector ＜5mW and is safe for use.